A simple way to learn more about a silencer is to measure how it will respond to a single frequency. If we repeat this measurement for more frequencies we will get an indication of how the silencer will respond to noise with a wide spectrum of frequencies. To automate this process we can use the noise generator to play a sweep and log the noise level. Here is two data series from an experiment with a 6 mm silencer. The first red line is for the noise generator without the silencer and the second blue line is with the silencer. The difference between the two data series tell us how effective the silencer will be in the whole frequencies spectrum. 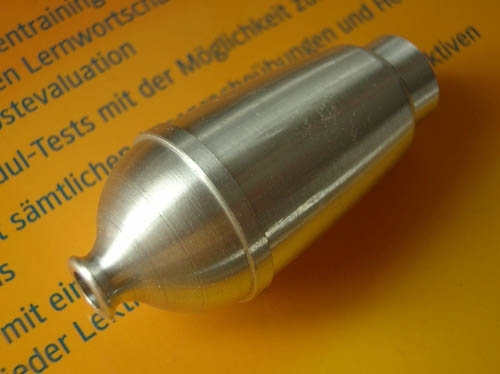 This test will only tell us how the silencer will respond to noise in atmospheric air at room temperature. When the silencer is working on the hot exhaust gasses from a running engine the speed of sound will be different and the resonance effects will be different.